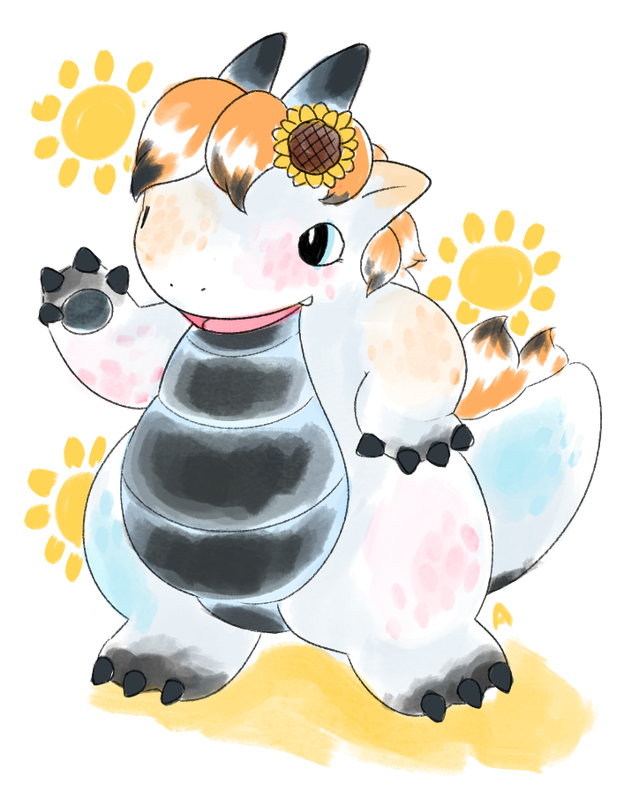 Flora is a furry dragon based on kaiju-type vinyl toys! A cool big-sis type who's very relaxed but can be quite nurturing or scolding! Bright and sunny! She is not naive but may pretend to be ignorant about something if it makes things easier for her. She likes to go with the flow and avoid conflict for the most part. She cares a lot about her friends and tries to take care of them. She loves sunflowers! She likes relaxing, swimming/floating, sweets and carbs. She likes fashion and shoes but can't always fit into everything. She doesn't like it to be too hot! She is white with soft airbrushed-looking markings in blue, pink, and orange. Plus claws, horns, and belly that look light blue with black airbrushed over. She has light orange hair with black tips that runs down her back. She is a chubby stocky dragon, but she can also appear more anthro or have breasts! She is normally flesh and blood, but sometimes she can be made of vinyl! A special power?? Poofy sneakers, crop tops, overalls, things that fit her!